Brunos Italian Kitchen, the popular Italian restaurant in Brea Downtown, launches their new fall and winter menu today featuring new appetizers, entrees, pasta, desserts, and cocktails. 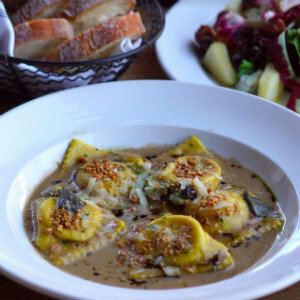 One of the new seasonal menu items is the Winter Squash Ravioli made with roasted winter squash, ricotta, parmesan, nutmeg, sage brown-butter cream, and hazelnuts. The pasta pairs nicely with the Green Virgin, one of the new cocktails made with Tanqueray gin, green chartreuse, lemon juice, bitters, extra virgin olive oil, and egg white. To complete the meal, enjoy the new dessert - Roasted Pumpkin Bread Pudding topped with walnuts, cardamom, and vanilla cream sauce. Brunos Italian Kitchen is at 210 W. Birch St. in Brea.